Owner and head instructor of Cannon Equine Instruction. Kelly is a Certified Horsemanship Association Master level certified instructor (Level 4 Western and level 4 English with jumping) as well as a certified Assistant Clinic Instructor. Kelly has been teaching for over ten years and started out as a trail and barrel racing instructor. From there she became interested in many different disciplines and aspects of the horse industry. Kelly teaches all different levels and really enjoys the theory related to riding and horses. Today she enjoys dressage and endurance riding along with teaching her students! Victoria is a Certified Horsemanship Association Master level certified instructor. She has been teaching for over five years and is currently pursueing a degree in Animal Science with a concentration in Equine Business from Clemson University. Victoria teaches at Cannon Equine during the summer and breaks from school. She teaches all levels of riding and is personally interested in hunter jumpers. Ashley is a CHA Level One English and Western Certified Instructor. Ashley has a background in teaching and administration and is now sharing those teaching experiences with us at Cannon Equine! Ashley will be teaching beginners as well as level one riders. 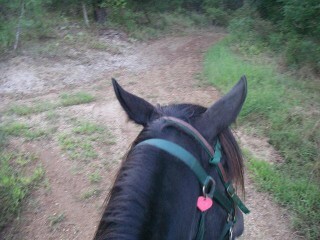 She enjoys riding her gaited horse as well! Emily is a CHA certified assistant instructor. You will see Emily around the barn assisting in lessons as well as beginning to teach some level one lessons. We are excited for her future as she practices instruction as well as continuing her own horsemanship education! Jodi is a CHA certified assistant instructor. You will see Jodi around the barn assisting in lessons as well as beginning to teach some level one lessons. We are excited for her future as she practices instruction as well as continuing her own horsemanship education! Note: Camp is sorted by the level that the student is working toward. If you are working toward a Level 1 certificate you should sign up for the Level 1 camp, if you have passed Level 1 and are working toward a Level 2 certificate you should sign up for the Level 2 camp, and so on. If you are unsure, ask Kelly or Victoria.